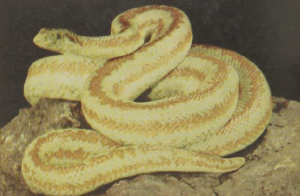 The western United States is the home of two small crepuscular (hiding) boas that range up to about 2 feet in length. These shy animals live on or below ground, burrowing in loose soil. Both give birth to living young and differ mainly in their color patterns. The Rosy Boa has a striped body, while the Rubber Boa is of a uniform greenish-brown color without a pattern, giving it a rubbery appearance. 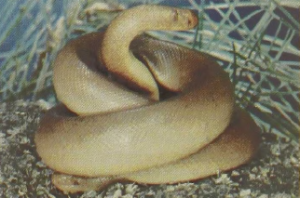 The Rubber Boa is found along the Pacific Coast from Mexico to Washington and eastward into Montana. When disturbed, these small, inoffensive rodent-eaters will roll up into a ball, hiding the head in the center. Both are excellent climbers, using concertina movement with part of the body fixed while the rest is being pushed along.